CSU’s Public & Contextual Theology Research Centre is now hosting the International Journal of Public Theology. PACT Professorial Fellow Clive Pearson is the journal’s new Editor-in-Chief and PACT Assistant Director Peter Walker is now Assistant Editor. The International Journal of Public Theology, produced by the highly regarded E J Brill Publishers in the Netherlands, is a premier journal in its field. The first edition published under PACT’s oversight was dedicated to the intersection of Public Theology with religious pluralism and education in liberal democracies. Proofs for the second edition, currently with Brill, break new ground: all articles address aspects of Public Theology in Chinese contexts. There is no equivalent text in the English language and the PACT editorial team has crafted this edition in collaboration with colleagues from universities in Shanghai and Hong Kong. A subscription to the IJPT is a sure way to keep on top of recent scholarship in the field of Public Theology and of supporting the work of PACT colleagues. 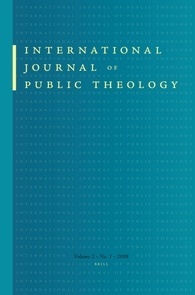 Subscriptions can be ordered at http://www.brill.com/international-journal-public-theology and copies of the journal are available from libraries associated with the CSU School of Theology.